Dressing up to the nines would more often than not having a designer garment hug your curves, but sometimes, you might want to let loose and be a little bit crazy. 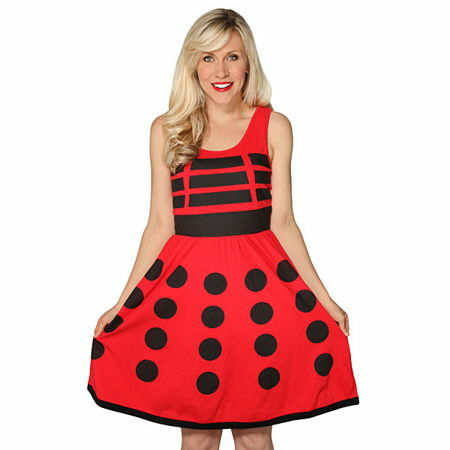 Case in point, the $44.99 Dalek A-Line Dress. The name of the dress itself gives the game away, and Doctor Who fans would definitely love to see their gals wear this unique number the next time they go out on a date! The Dalek A-Line Dress would not include any plunger, but it comes in a fabulous shade of red or gold that will hopefully exterminate any other competitors in the vicinity. This is an officially licensed Doctor Who merchandise that is made out of 95% cotton and 5% spandex dress, although you might want to master the electronic voice that goes around threatening to exterminate just about everyone.